Prime Minister Narendra Modi on Saturday said the Congress has accepted defeat in Himachal Pradesh and will not return to power in near future. Addressing an election rally here, Prime Minister Modi said, "Leave alone this election, in the years to come, like Bihar and Uttar Pradesh, the Congress will not be visible even with a microscope in Himachal Pradesh." He launched a scathing attack on the Congress by saying that the grand-old party has backed off and accepted defeat. "During elections, generally the top leaders of the party campaign for their parties in the last phase of the campaign, but for the first time Congress' central leaders have not come to Himachal Pradesh. They have accepted defeat. It also seems that they have left Himachal Pradesh Chief Minister Virbhadra Singh to his fate," Prime Minister Modi told a large gathering here in district Kangra. He also said that the Congress was taking some sort of revenge from Virbhadra Singh, reasons best known to it only. "Two days back, I had come to Himachal and today I have come again and I can see lotus (BJP's election symbol) everywhere," the Prime Minister said, adding that "people across the country are cutting themselves off from the Congress because of their 'Karnamas' (deeds)". He also talked about his government's fight against corruption through demonetisation. "We are fighting corruption whereas Congress is preparing to mark November 8 as black money day and burn my effigies, but they don't know Modi is disciple of Sardar Patel and won't be cowed down," he said, adding that "people who were habitual looters & have had to return their loot today won't let me be at peace. Even you know that". On November 8, 2016, Prime Minister Narendra Modi announced to demonetise Rs 500 and Rs 1000 banknotes. The Opposition parties have announced to observe November 8 as 'black day' to oppose demonetisation. 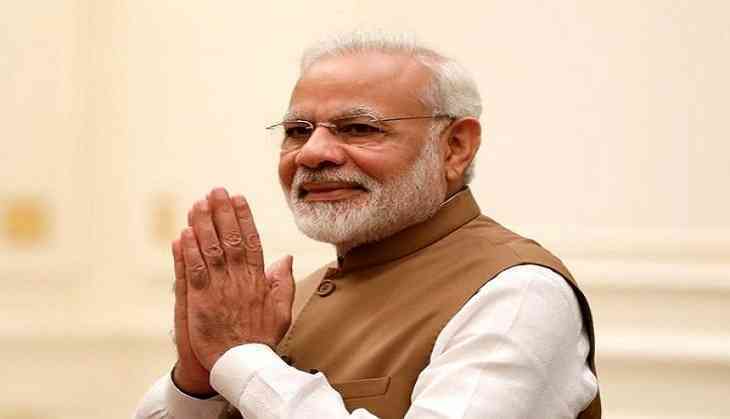 The Prime Minister also apprised the rally about various schemes initiated by the Bharatiya Janata Party (BJP) led National Democratic Alliance Union government. "Over 18,000 villages did not have electricity since independence. We took up task of electrification of such villages in mission mode. After coming to power, we eliminated procedure for interview for class III & IV jobs. Everyone agreed but the Congress ruled states denied. Through the Mudra Yojana, we are empowering the budding entrepreneurs across the country," Prime Minister Modi said. He also hailed people of Himachal Pradesh for their service to the nation. "Himachal Pradesh is the 'Veer Bhoomi'. We are proud of our jawans of this land who guard the country," Prime Minster Modi said. He also urged the people to vote in large numbers on the day of voting for assembly election. "Himachal Pradesh has immense scope for development and hence I urge people to turn out and vote in large numbers on November 9. There was maximum development in Himachal when Atal Ji (former PM Atal Bihari Vajpayee) was in Delhi and Dhumal Ji (Prem Kumar Dhumal_ was here in Himachal. You have a chance again," the Prime Minister urged. The battle lines are already drawn for the Himachal Pradesh Legislative Assembly election scheduled to be held on November 9 and the results will be declared on December 18. On October 31, the BJP announced former chief minister Prem Kumar Dhumal as its chief ministerial candidate. After announcement, BJP President Amit Shah said Prem Kumar Dhumal will become chief minister of Himachal Pradesh after December 18. On the other hand, Virbhadra Singh on November 1 taunted Prime Minister Modi over the announcement of Dhumal as the BJP's chief ministerial candidate for the upcoming state assembly elections by saying "Big titans (Prime Minister Narendra Modi) have gone, and Dhumal ji is a known face". Since Prime Minister Modi assumed power at the Centre, the BJP has been mainly fighting various elections in his name. Earlier, Vikramaditya Singh, Virbhadra Singh's son, also had said that announcement of Dhumal's name as BJP's CM candidate shows that the party is on the back foot in the state.